Clean the pot, vase or pail and dry thoroughly. Choose a variety of tape in coordinating greens, and play with layers horizontally and vertically. Apply diagonal, overlapping lines to create the illusion of grass. Win a Scotch Expressions prize pack before April 30th by entering the giveaway through the rafflecopter below. Please leave comments and follow my social media links to be eligible to win. Haven't tried them yet! From Vancouver! I live in BC and no haven't used the products before. I live in Alberta and no I haven't used Scotch Expressions before but have used their other products such a regular Scotch Tape for years! I live in NB. I haven't used tape like this before but would love to! I live in Ontario. I have never used Scotch Expressions before. i am in BC. I have not tried the Scotch Expressions yet. I live in Ontario and have never used Scotch Expressions before but would love to win this! I'm from Victoria BC and I've never used this tape before! I live in Ontario and no, I have not tried this product before. I live in Alberta, I am sad to say I haven't used Scotch Expressions Tapes before. I will be on a look out for them. No, I've never used Scotch Expressions products. I live in London Ontario. Have never used expressions tape before but would look forward to what my dd would create with it. I'm in the province of Quebec and so far I have never used Scotch Expressions. I live in BC and I haven't tried these before, but they look awesome! Manitoba. I haven't used expressions tapes yet. NW Ontario. I've never used Expressions tapes, but would love to. I`m in BC. I have not used Scotch Expressions tape yet. I live in Saskatchewan. I have used it for crafts and to decorate presents. In TO, never used Scotch Expressions tapes before but would love to, looks like such a saver. I live in NL. No,I have never used Scotch Expressions tape before! I live in AB. I've not used the Scotch Expressions tapes before. have not used Scotch Expressions tapes. I'm in BC. i have never tried these tapes before. I live in Ontario. I haven't tried these tapes before! I live on Ontario and have never used these products before. I'm in New Brunswick and I haven't used Scotch Expressions before. It looks lovely though. I live in Ontario. No, I've never used this before. I live in Alberta. No, I don't think I've used Scotch Expressions tape before, just regular Scotch tape. I live In Ontario. I haven't tried these before but would love to make a vase! 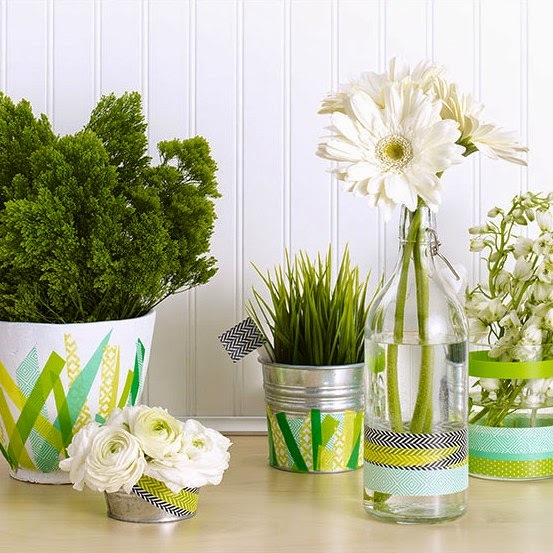 Scotch Expressions decorative tape is a wonderful way of making your everyday decor look new and fun at the same time. It comes in a variety of widths, patters and colors. You can use almost anywhere. You can make a statement on your wall with it, if you rent and cannot paint your home. I love to use it on plain furniture by giving it a classical outline as well as candle holders and vases. You could take a vase and use one color at the bottom a contrasting color in the middle. You could this in lines, checker board, stars whatever your heart desires. So get to work, I'd like to see some of your results! Happy Expressions! I am in Ontario, I have never used Scotch Expressions tapes before. I live in Newfoundland Canada and I have never used Scotch Expressions tapes before. I live in Newfoundland Canada and I have never used Scotch Expressions tapes before? I would love to have the opportunity to try Scotch Expressions. I have seen this used for alot of updating and beautifying things through the internet. I could advertise for you given the chance; however my husband and I are both disabled and I cannot afford anything extra. I have to use what I have. But I am entering your contest and being hopeful that I will be given the chance to try out some of my ideas. I am most definitely a regular on Flipboard! I live in BC and I have not used the scotch expressions tape yet, but looking forward to trying it. I didn't even know Scotch made this - looks cool! I live in Ontario, I've never used Scotch Expressions Tapes before! They are very cute! I live in Saskatchewan. I have never used Scotch Expressions tape. I live in BC and I have never used Scotch Expressions before. I'd like to use it to do art projects with my daughter. I live in BC. I haven't tried Scotch Expressions yet. Im in Ontario and I have not tried them yet. I'm in Ontario and haven't tried these products before.